When pulling fabrics for a child's quilt, I seem to have a much easier time selecting prints, patterns and colors for a girl's quilt. Part of my problem is that I tend to have a hard time finding "boy" fabrics that I like. But last summer Sarah Jane really hit it out of the ballpark with her Children at Play line. I just love her artwork, something about the innocence of the designs - paper airplanes and sailboats, hopscotch and dress up dolls, pinwheels and wagons. I decided to take some of the little boy line and pair it with some of my favorite blenders in green, blue, yellow, orange and red. I quilted this quilt in a diagonal grid. It was the first time I used the metal guide that came with my walking foot. It was actually quite helpful! The lines are about 1.5" apart. I marked the starting line and then just used my guide to work off from there. The back is a lime green and the binding is a turquoise. 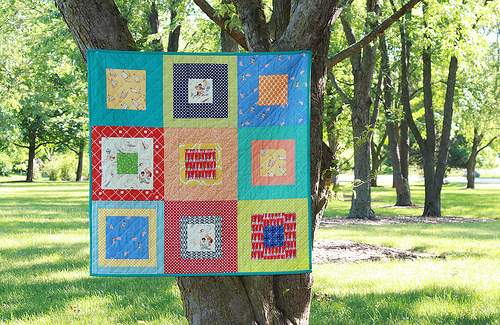 The blocks are 12" squares and the final quilt measures 36" x 36". 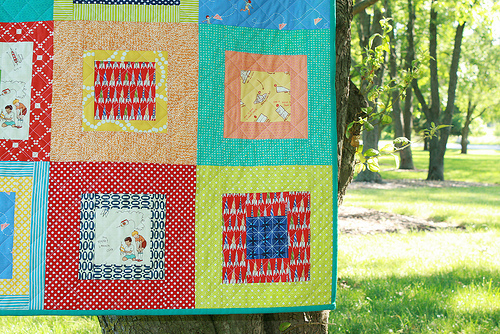 I decided to list this little quilt in my shop - it is so lacking in boy items!